Can dogs eat mushrooms or are they dangerous to dogs? Vet approved! Can dogs eat mushrooms or can they really be poisonous to them? Mushrooms are good sources of nutrients. They contain high amounts of vitamin D, niacin, protein, enzymes, and antioxidants. Various types of delicious dishes are made from different types of mushrooms. There are thousands of mushrooms species, but not all of them are edible. About 1% of these mushrooms are highly toxic not only to people but also to animals. Mushrooms available in stores are usually cultured, thus these are much safer for humans as well as their pet dogs compared to wild mushrooms. But the big question is, are mushrooms beneficial to dogs? There are so many species of mushrooms, and most pet owners won’t be able to tell all edible from poisonous mushrooms. If you want to learn how to identify good from bad mushrooms, this post might help. Mushrooms are not part of a dog’s daily diet. While these are rich in essential nutrients, there are far better sources which are safer and wholesome. But if really want to give mushroom to your dog, make sure it’s bought from the store. And make sure you cook it well. Mushrooms have a tough lining that dogs are unable to digest. 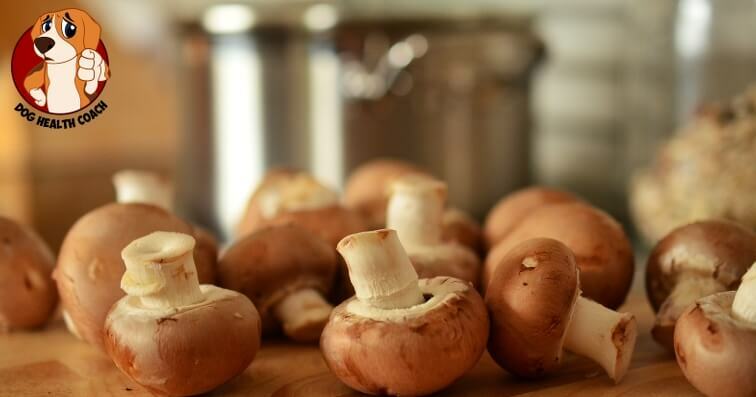 Cooking mushrooms can also help release some of the nutrients present in the mushroom and inactivate some of the toxins present. Can all dogs eat cooked mushrooms? It is important to remember that just like humans, some dogs may not tolerate mushrooms and may suffer from digestive upsets; other dogs may also develop hypersensitive reactions or allergies. How many mushrooms can a dog eat? Mushrooms can be given as treats and should not constitute the bulk of a dog’s diet. One popular type is the button mushroom which is low in calories and can occasionally be given as a treat. If it’s your first time to give mushroom to your dog, feed a small quantity of cooked mushroom first and closely observe how the dog reacts. The type of toxic reaction and organs affected highly depends on what species of mushroom is consumed. If your pet has eaten mushrooms and is showing any of these symptoms. DO NOT INDUCE VOMITING AS THIS CAN POSSIBLY LEAD TO THE MUSHROOM GOING INTO THE LUNGS. SPEAK WITH YOUR VET FIRST! My dog ate a mushroom in the yard – what should I do? If you noticed your dog ate mushroom from your yard, you should get to a vet IMMEDIATELY. Some toxins of poisonous mushrooms can act very fast and can quickly kill a dog. Even if they aren’t toxic, your dog may experience an allergic reaction, which is just as threatening. The wrong type of mushroom can possibly cause permanent organ damage to pets. AGAIN: DO NOT INDUCE VOMITING AS THIS CAN LEAD TO ASPIRATION INTO THE LUNGS! TALK TO YOUR VET FIRST! How is mushroom poisoning in dogs treated? The treatment of mushroom poisoning depends on the intensity and severity of symptoms. The sooner the dog is seen by the veterinarian, the better the prognosis. The treatment protocol is focused on stabilizing the dog, decontamination, and symptomatic treatment of any clinical signs that may be manifested. Decontamination involves inducing vomiting to remove bits and pieces of mushroom that may still be in the stomach. Some vets choose not to induce vomiting because of the risk of aspiration into the lungs, increasing the animal’s risk to aspiration pneumonia which can also be fatal. Next, activated charcoal is administered to absorb any remaining toxins. If there are uneaten mushrooms, you should bring them to the vet. More often than not, it is impossible to predict the outcome and give a prognosis until the species of mushroom is identified. Treatment may also include administration of intravenous fluid, oxygen, liver-protectant medications, anti-vomiting medication, and supportive care. In most cases, supportive care and monitoring is all that is required. There are no specific antidotes to mushroom toxins so it is vital to get the dog quickly to the vet so that further absorption can be prevented. If you live in a wooded area where mushrooms grow wild, it is your responsibility to make sure that your dog does not eat any of these mushrooms. While there is an unrealistic fear of wild mushrooms due to the toxicity, most of the mushrooms that grow in the wild are generally safe. But it is difficult to know and there is always a chance that the dog may have eaten a toxic mushroom. It is always better to be on the side of caution than to be sorry.